I made a rare visit west of the Bann for today’s townland. I drove all the way to Bellaghy. My destination was the townland of Old Town Downing. 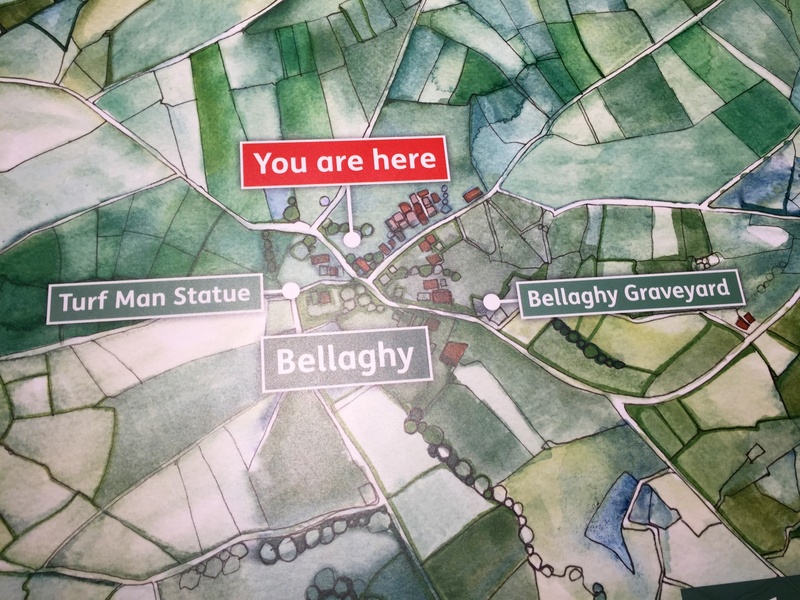 This townland used to be called Bellaghy – same as the village. Then it was renamed “Old Town”, and later divided into Old Town Deerpark and Old Town Downing. Compared to the signs I’ve photographed so far, this one gives more information. The names appear in Irish as well as English. And I like the way the word “townland” is printed in full in the English version, instead of being abbreviated to “TD” . 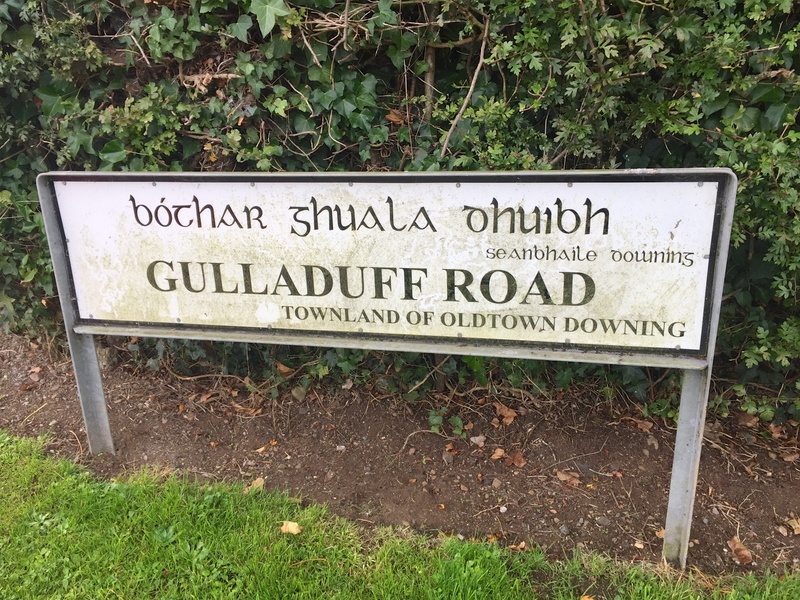 Gulladuff, the name of the road in the photograph, is also a townland, located a few miles away. The English name comes from the Irish Guala Dhuibh, which you can see on the sign, meaning “black hill-shoulder”. I had one particular reason for visiting Old Town Downing, as you can see from the brown sign below. Seamus Heaney HomePlace, which opened in September 2016, is an arts centre. 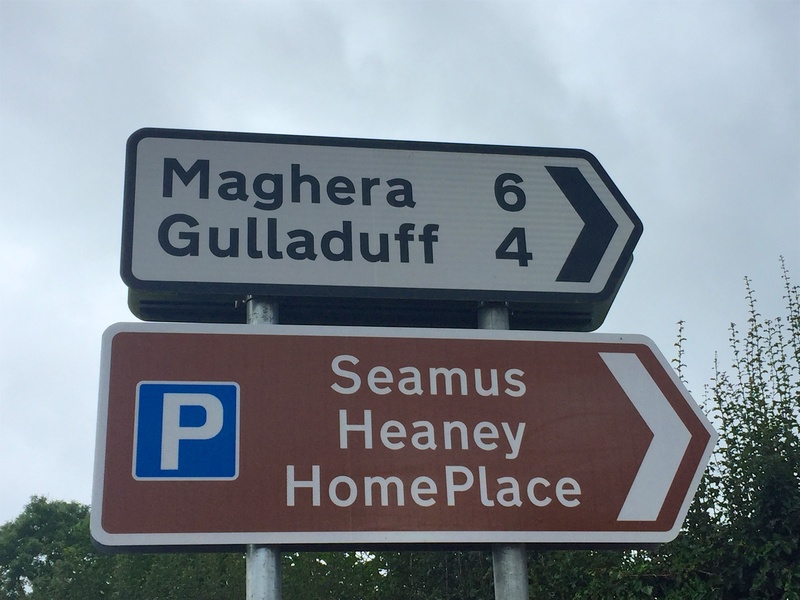 HomePlace has a performance space called “The Helicon” and an exhibition celebrating the life and work of the late poet and Nobel Laureate, Seamus Heaney. HomePlace has an excellent exhibition, photographs, a film, a re-creation of the poet’s study, an old school desk, a shop and a café, but most importantly there are plenty of chances to read the poems and listen to recordings of Heaney reading his own work. Words are in the air here. So many words. Somewhere in that thicket of words is “dailigone”. 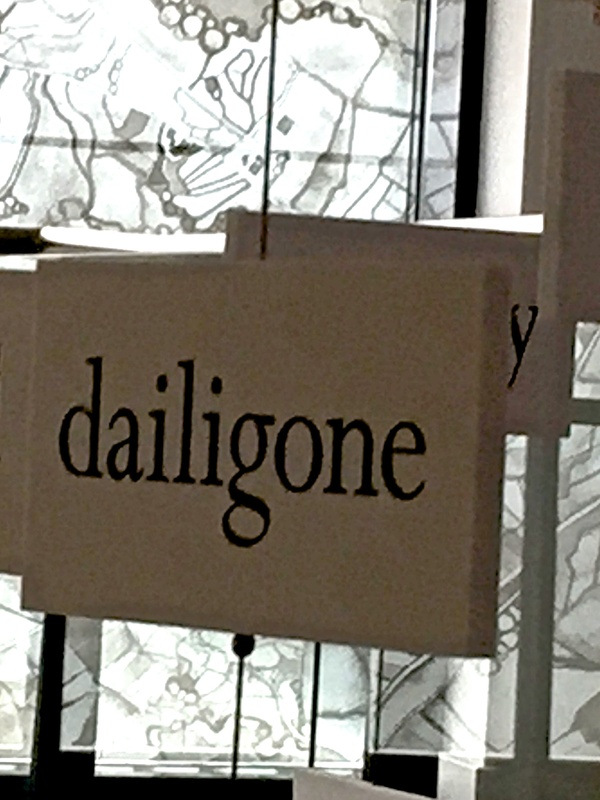 The idea that “daylight is gone” becomes dailigone, a word meaning “dusk”. 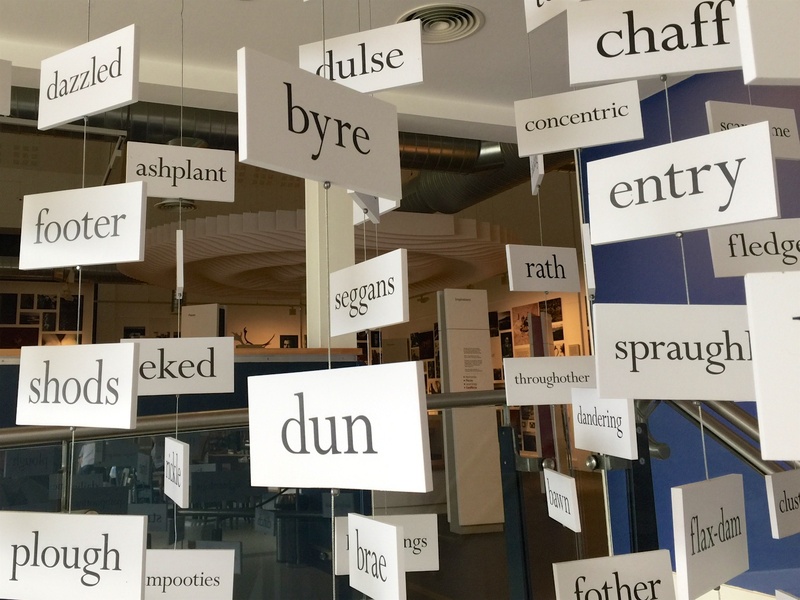 Click here for the Seamus Heaney HomePlace website. 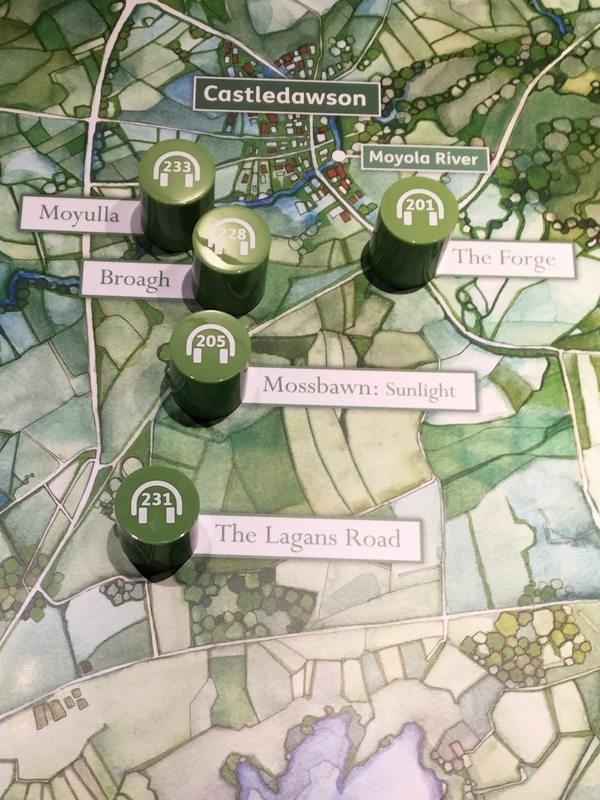 Which townlands border Old Town Downing? To the north, Mullaghboy. To the east, Old Town Deerpark. To the south, Ballydermot. To the west, Killyberry Boyd. Click here to see a map of Old Town Downing on Townlands.IE. It’s a great idea for a display. All the words are hanging down from the ceiling, near the stairs, so that you can look at them from different spots as you walk through the building. All the words are taken from Heaney’s poetry, but there’s a mix of words that occur in most versions of English, and some that I’ve never heard outside an Irish/Ulster/Scots context (but I wonder if some of them occur in Canada too).